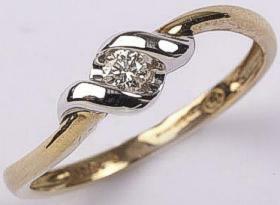 9 carat gold diamond rings for that special gift at wholesale prices. 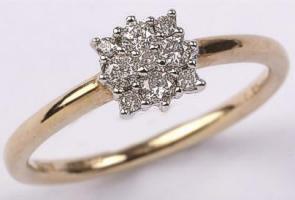 We stock Diamond solitaire rings, Diamond cluster rings from quarter carat upto 1 carat gold diamond rings. Trilogy diamond rings in yellow and white 9 carat gold settings with 0.33ctw upto 1 karat quality diamonds. Large ladies Knot woven design Diamonds set Ring. Very wide 10mm ring with elegant Diamonds. 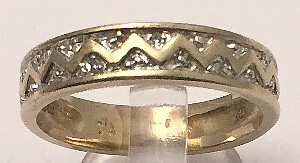 9 carat yellow Gold Zig Zag design 4mm wide Diamonds set band ring. 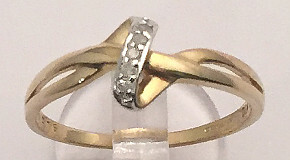 Half Eternity Style Wishbone Type DIAMONDS 9 carat GOLD RING. 9 carat Diamond ring designed in the shape of a single knot and set with 5 stones. 9 carat yellow Gold half eternity style Ring set with 7 Diamonds. Elegant band ladies ring with real diamonds set into top. 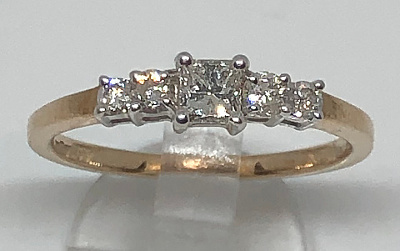 9ct Gold hallmarked ladies diamond ring. 9 carat Gold Full Eternity Ring set with Diamonds. 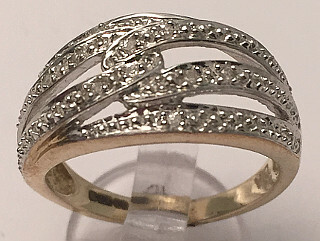 Classic eternity band design diamond set ladies ring. 9 carat Full Eternity Ladies Ring set with 0.50 Carats of Diamonds. 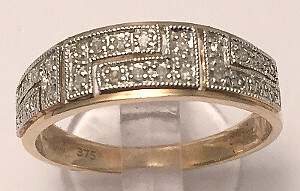 Stunning Classic eternity half Carat (50pts) genuine Diamond 9ct yellow Gold ring. 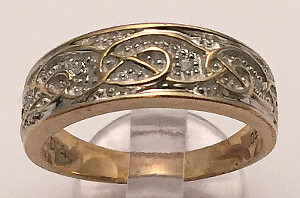 9ct Gold Greek design Diamonds set wide band ring. Ladies 0.50 Carat Diamond Ring with Princess cut stone. 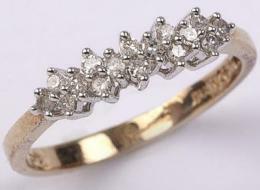 9 carat yellow Gold ring set with 5 Diamonds totalling half a Carat stone weight. 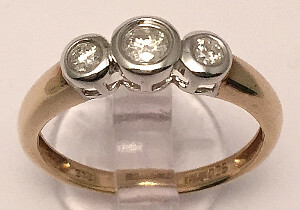 9ct Gold Diamond Trilogy Ring with 0.25 Carats Diamonds in Rub Over setting. 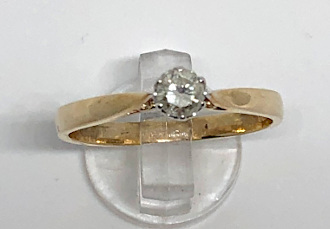 25 pts Diamond Solitaire 9 carat Gold Ring. 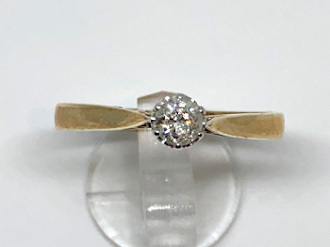 Solitaire Diamond 25 pts set in 9 carat Yellow Gold Ring Shank. 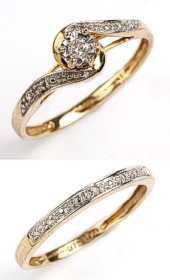 9 carat yellow Gold ladies Diamond Ring with 19 Diamonds in lattice style setting and Diamond shoulders. 0.25 Carat weight Solitaire Diamond Ring. 9 carat yellow Gold Ring shank set with quarter ctw Solitaire Diamond, SI clarity. 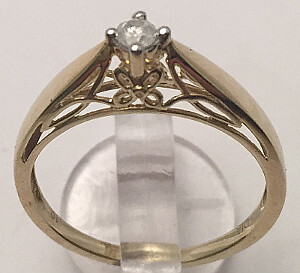 9 carat Gold fancy Diamond Solitaire set Ring with ornate scroll work on shank setting. 9 carat yellow colour Gold 0.25 CTW Diamonds Cluster Ring. 25 pts Diamonds 3 tier Cluster Ring. 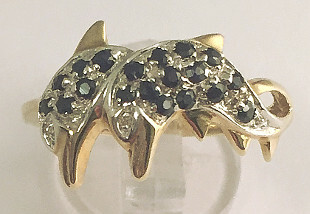 9ct GOLD 7 carat Smokey Quartz Large ring with Diamond set shoulders. 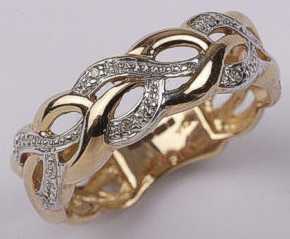 9 carat yellow Gold Diamonds set Wave design half eternity band ladies Ring. 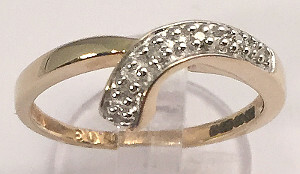 10 points Diamonds in Wave shape channel setting. 9ct Gold Diamond set Half Eternity Secret Message I LOVE YOU Ring. 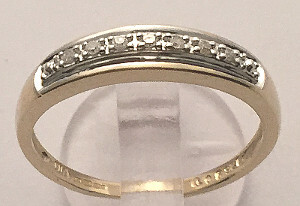 Love Ring with hidden hinged Love Message section hidden underneath top of Real Diamonds set Half Eternity Ring. 9 carat yellow Gold 2 piece set of Diamond Bridal Rings. Includes Diamond set 9ct Gold band (half eternity style) and cross over twist design Solitaire central Diamond ring with Diamonds set shoulders (set of 2 rings). Stunning 0.10 Carat Solitaire Diamond tension set in 9 carat Yellow Gold with White Twist around setting. Solitaire Diamond Ring in curved twist setting. 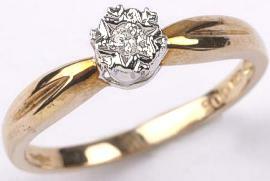 9 carat Gold Diamond Solitaire Ring with star design illusion Diamond setting. 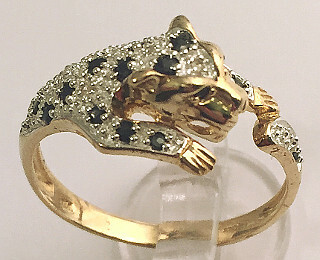 15 point Diamonds 9 stone square cluster 9 carat yellow Gold ring. Total 0.15 Carats Diamonds ring. 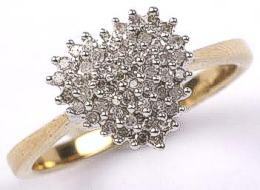 50 pt Diamond Cluster 9 carat Gold Ring. Half a Carat of Diamonds in Cluster yellow Gold Ring. 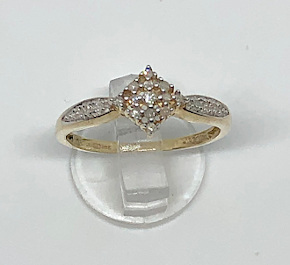 9ct Yellow Gold Diamonds Cluster Ring with Stones set in Square large 7mm wide setting design, 0.25 Carats Diamonds weight. 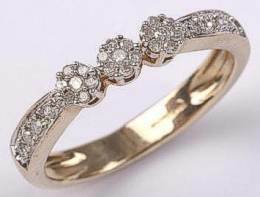 9ct Gold Heart design 4 tier Diamond Cluster Ring, total 0.25 Carat Diamonds in Heart shape design. 9 carat yellow Gold Ring with fancy triple Clusters and Diamond set shoulders. Total 0.20 Carat Diamonds set in three cluster design 9ct ring. 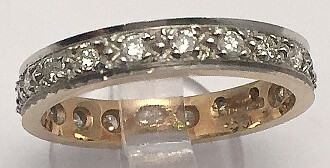 9 carat Gold two row Diamonds sparkly fancy ring. Total 0.20 Carats Diamonds. 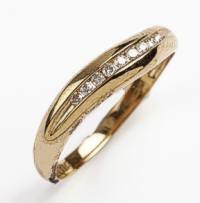 0.50 Carat Diamonds double row 14 stone 9ct yellow Gold Ring. 50pt 2 row style Diamond Ring. Diamonds set wide Ring with twist scroll work design in top of ring inset with real Diamonds. Trilogy Diamonds 0.10 Carat Kisses Ladies 9 carat Gold Ring. 9 carat Yellow Gold 0.10 Carats Diamonds Cluster Ring. 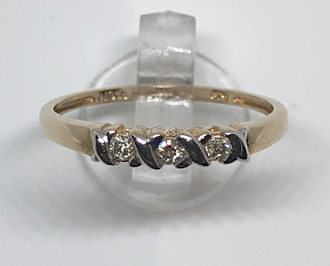 9ct yellow Gold scroll twist 5 stone Diamonds set ladies Ring. 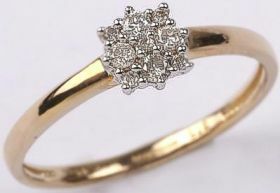 9 carat Gold twin Leaves Diamond set ladies Ring. 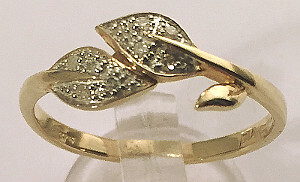 Stunning elegant 9ct Gold hallmarked Leaf design ring set with real Diamonds with intricate detailed leaves.